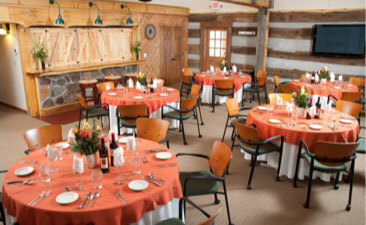 Breakfast is served daily in the original log cabin, our sun room or on the patio weather permitting. It is highly recommended to make breakfast reservations to avoid a wait for a table. Overnight guests receive a hearty complimentary breakfast. Outside guests are also welcome to join us for breakfast. Rest assured your breakfast experience will be a memorable one. 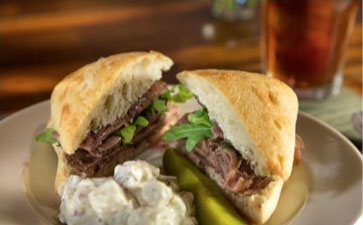 Our menus change seasonally to reflect locally grown vegetables and fruit in season. Extra, extra, read all about it! 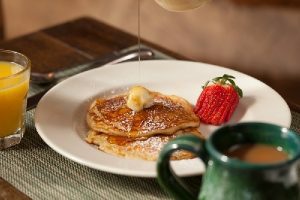 The Inn & Spa at Cedar Falls offers breakfast delivered to your door. 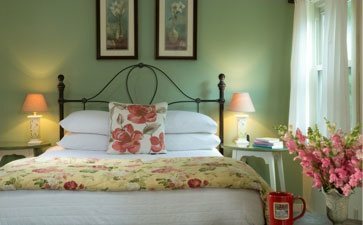 Some guests prefer to stay in their room or cottage and not get dressed or want more uninterrupted time with their loved one or extra time to “look for deer”. However, most Inn guests like coming to the restaurant for breakfast. They love the ambiance, smells coming from our kitchen/dining room, sitting outside on the patio and talking with our staff. Now, you have the option to do either one. Or, maybe one day you get breakfast delivered and the other eat in the restaurant. We aim to please, and the choice is yours. When you arrive for check in just let us know if you want breakfast delivered. If so, you will fill out a form from our choice offerings. Selections will include juices, granola, fresh fruit, steel cut oats and our house made muffins. Breakfasts will be delivered each day between 8:30-9:15am. There will be a $25.00 delivery charge and it will be added to your bill at check out.